Serefina, daughter of Isabella, Queen of Miromara, has been raised with the expectation – and burden – that she will someday become ruler of the oldest civilization of the merfolk. On the eve of the Dokimí ceremony, which will determine if she is worthy of the crown, Sera is haunted by a strange dream that foretells the return of an ancient evil. But her nightmare is forgotten the next day as she diligently practices her songspell; eagerly anticipates a reunion with her best friend, Neela; and anxiously worries about Mahdi, the crown prince of Matali, and whether his feelings toward her and their future betrothal have changed. Most of all, she worries about not living up to her mother’s hopes. The book starts off with a “dream”. There is a circle of river witches, chanting, trying to keep a beast in it’s cage while still being able to spy on it. Then a song follows that sets up the premise for the entire series. Serafina then wakes up to her mother yelling at her to do so, because today is an important day. It is her Dokimi, a ceremony where she is declared the rightful heiress to the Miromara thrown, or killed. If she is declared so, she then sings a song about the history or Miromara, and then gets betrothed officially to a Prince from another Mer Kingdom. At night, during the of the Dokimi, Serafina passes the blood test given to the princesses. She also sings the song that is required of her. That’s when all hell breaks loose. As she finishes her song, there was an attack on the royal family of Miromara. The royal family visiting from Matali gets lost in the scramble. Sera and her friend Neela, Matali’s royal princess, are escorted to her mothers stateroom, which then gets attacked by a sea dragon. They escape the palace and go on a life changing adventure where they will meet new and unexpected friends, develop a deep and meaningful connection with others, and most of all hopefully save the world. Thank God for a glossary. There were…quite a few words that I needed it for, that’s for sure. I really did like this book though. I mean, mermaids! COME ON! Who doesn’t like mermaids? There is a lot of exposition in the first 100 pages of the book. It’s mostly set up for emotions for Sera and world set up though, so it’s reasonable. And not at all boring like I find most other exposition. From what I remember about this book is that was a solid 4 stars and definitely a middle grade read, or at least written similar to books I read in middle grade. 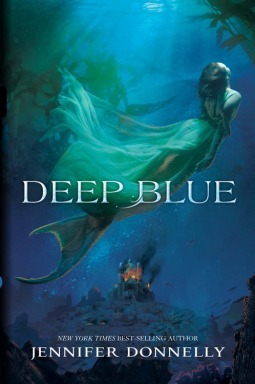 I really did enjoy this book because again, it is about mermaids. I also happened to have marathoned the 3 books that are currently out and am impatiently waiting for the 4th and final book to come out in May. The way that the world is described is just stays in your mind and as you are reading the story you can easily imagine how the world is set up. This entry was posted in Book, Book Review, Uncategorized and tagged author, book, book review, book reviewer, books, deep blue, jennifer donnelly, mermaids, review, young adult. Bookmark the permalink.